Harvard University Press, 9780674376014, 118pp. 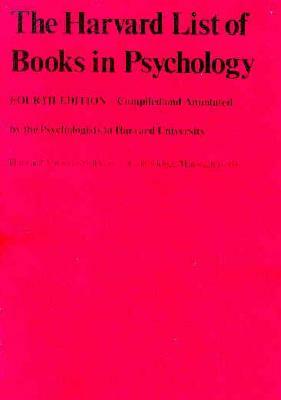 The Harvard List of Books in Psychology was first compiled in the 1930s, when each student in the department enjoyed the luxury of an individual tutorial. Together tutor and student could map out a course of reading. By 1938, the list had proved so useful that its 349 titles were annotated and printed, though mainly for local consumption. Growth of an outside demand from students, librarians, and the reading public led to a supplement in 1944 and a number of successive editions bearing the present title. The present edition updates the List without expanding it beyond useful size: for each new title the compilers have faithfully tried to delete one, and new entries account for almost half of the present total of 744. Each title is annotated with descriptive and evaluative material.